NEW YORK, Jan 10, 2012 (IPS) – Less than two months before Iran’s parliamentary elections, as much of the opposition mounts a boycott of the polls, a wave of arrests and lengthy prison sentences for political activists and journalists appears to herald a renewed crackdown in the Iranian capital. The pressure comes as Iran faces new sanctions from the West over its nuclear programme and increased tensions with the United States, with Iran threatening to close the strategic Strait of Hormuz and blockade up to a fifth of the world’s tanker-borne oil. On Monday, Mehdi Khazali, the dissident son of an influential conservative ayatollah, was arrested and a few hours later, his popular website was hacked.On Jan. 8, security forces arrested Saeed Madani, an influential member of the Nationalist-Religious group, which is critical of the Islamic government, while he was walking on the street with his wife. That same day, journalist and ethnic issues researcher Ehsan Houshmand was arrested at his home. 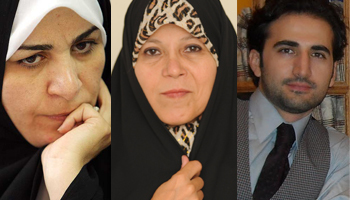 Journalist Fatemeh Kheradmand was also arrested. On Jan. 3, the Tehran Revolutionary Court sentenced Faezeh Hashemi, a former member of parliament and daughter of Ayatollah Hashemi Rafsanjani, head of Iran’s Expediency Council, to six months in prison for participating in anti-government protests. Fakhressadat Mohtashamipour, an advisor to the interior minister in former President Mohammad Khatami’s cabinet, was also sentenced to four years’ suspended imprisonment. Her husband, Mostafa Tajzadeh, a prominent reformist figure and a former deputy interior minister, is currently serving a six-year term inside Evin Prison. But the most shocking verdict belonged to Amir Hekmati, an Iranian- American citizen. On Monday, a lower court found Hekmati guilty of “cooperating with the enemy state of US, and the CIA against the Islamic Republic of Iran,” identifying him as a “Mohareb” (enemy of God), “and a corrupter-on-Earth”, and sentenced him to death. Hekmati had entered Iran on Aug. 15 to visit with his family. On Aug. 29, he was arrested on espionage charges. During his four-month long detention, he did not have access to a lawyer, nor was he able to contact relatives in the U.S.
On Monday, Iran’s Supreme Leader, Ayatollah Ali Khamenei, said he was confident there would be a large turnout for the elections, the first national polls since the disputed 2009 vote that returned President Mahmoud Ahmadinejad to power. The Guardian Council is expected to release the list of approved candidates this week. Iran’s two opposition leaders Mir Hossein Mousavi and Mehdi Karroubi, as well as Mousavi’s wife, have been under house arrest since last February, while a large number of reformist figures are serving long prison terms. By excluding reformists and other groups critical of the regime, a widespread boycott could seriously damage the legitimacy of the Iranian government, which has remained tarnished since the mass protests and arrests that followed the 2009 polls. In order to keep the election machine going, it seems the Iranian leadership has chosen to follow a classic pattern: intensify the domestic crackdown on critics; curtail the flow of information via the media and internet; and finally, pursue aggressive foreign policy rhetoric. “This is why they try to block all the roads, so that information about the parliamentary elections is less able to find its way to the outside world,” he added. Following the 2009 election and complaints of widespread fraud by reformist candidates who had run against Ahmadinejad, millions of Iranians poured into streets of Tehran to protest the results. Iranian authorities cracked down on the protesters, arrested thousands, and using violence, forced people back into their homes. Last week, Mostafa Tajzadeh accused the Supreme Leader’s son of trying to quash dissent ahead of the March elections. He has acknowledged that the vote may be “the most sensitive elections in the history of the Islamic Republic”. A Tehran university professor said drily that talking with foreign media after the 2009 election is considered “sending information to foreign intelligence services”. The Iranian government is particularly sensitive about individuals who use the internet to express their opinions, whether in blogs or on Facebook or Twitter. One university in Iran has banned its students from joining Facebook. On Jan. 1, the Iranian prosecutor general’s judicial advisor warned about “criminal” use of the internet related to the elections. According to the published 25-point list, even joking about the elections is considered a crime. Three days later, the police’s cyber unit published a statement announcing that users at internet cafes would have to present a valid identification card, and provide personal information and telephone numbers. Owners are obligated to install closed circuit televisions in their establishments and to keep the captured images for six months, so that they may be reviewed. Owners are also obligated to keep user information, including the dates and hours of usage, websites, and pages viewed, and keep the records for six months. Still, many critics of the government remain unrepentant and undeterred. “This is why she is pleased with this sentence, too,” the source said.